Tucker, interrupting: Well they’re relevant, your claim to—Slow down. They’re relevant to your claim to be a religion, and so I just—just give us a sense of what it is. Lucien: Actually, us being a religion has no bearing on us having a claim to the Free Speech Zone, either. Tucker, interrupting: I’m—I’m aware of that, but you—but you do claim to be a religion. I just wanna know what it is. Is it the worship of Satan? Tucker, interrupting: Oh, I bet. Lucien: —Satanism, but as I said, it really has no bearing on our claim to…access to the Free Speech Zone. Tucker: I guess the reason I’m pressing you on this is because I sort of know a fake media story when I see one, and the whole Satanism thing seems like that and I’m trying to take you seriously because I take religious people seriously—all of them—but this seems like a way to just kinda give the finger to everyone else. I mean, there’s probably not a lot of Satanists in this town of 6,600 in Minnesota, are there? Lucien: Well, there are some. And there are veterans—there are a good deal of veterans—within our ranks. We have about 100,000 members, many veterans, and there are veterans who don’t identify with us who still stood up for our right to speak, and we find that very often when we ask for equal access in the open forum, it’s usually veterans who come forward and speak in our defense and say these values of free speech and pluralism are the values that they fought for. Tucker: Amen, and I agree with that wholeheartedly, hence your appearance tonight. I think people should have the right to speak, but also they should have to answer questions…And the right to speak and the right to give the finger to the residents of this little town in Minnesota are not exactly the same thing. Lucien: That is not what we were doing. Tucker, at same time: Oh, of course that’s what you were doing. Tucker, interrupting: To—to—to what? A monument to what? Lucien: To veterans. This was first and foremost something to honor the veterans. The veterans who have fought and served. All veterans. Not all veterans are Christian, not all veterans are Satanist, but they did fight for pluralism and they did fight for free speech, and to that end, it’s nice to know that we can preserve those values. When they shut down the open forum, we weren’t actually celebrating that. We built this monument, we were ready to install it, we wanted to put it there, and it seemed like the residents of Belle Plaine weren’t entirely up in arms about this. Some of the word we got back said people thought our monument design wasn’t anything to complain about. The protesters from a Catholic organization, they also were out of state. And we get this stuff about a small town and beating up on a small town, but it was founded on free speech. Tucker, interrupting: Let’s—I’m—Let’s just be—You know, but that’s what—that’s what it is. Really, I dunno, try it in downtown Birmingham, Alabama or Chicago or something. But I mean, look, here’s the point I’m making? Is that there’s no comparison between Satanism, which is like a silly made-up religion that has no god even—non-theistic, as you conceded—and Christianity, Judaism, or Islam, which you know, agree or disagree, believe or not, are millennia old, they run hospitals, churches, schools…They form the basis of our civil society; they don’t really compare to what you’re doing. Do they? Tucker: I actually agree with your point strongly that people ought to be allowed to express divergent views in public. Tucker: I just don’t want to be sucked into the trap of having to take seriously what is not a serious thing. Do you know what I mean? So it’s one thing for me to agree with you and say yeah, we’re both for free speech, but you’re just giving the finger to bourgeoisie America! Lucien, at same time: If we weren’t being serious, I could understand what you’re saying. Lucien: You don’t have to. Tucker, laughing: Well, I don’t believe the numbers of any group that comes on this show! Lucien: Okay, so what if it were two? So what if it were two? We’d still have equal access to the open forum. Tucker, interrupting: Okay. Okay, so just sum it up for me. I’ll give ya thirty seconds. What’s the point of Satanism? 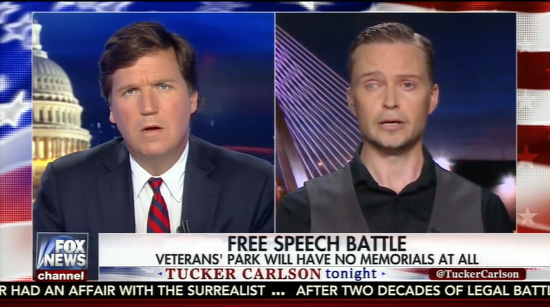 Lucien: …Well, to sum up a religious movement and its history in thirty seconds is isn’t quite fair (Tucker is stammering something incoherent and chuckling “okay” underneath), but I would say that Satanism embodies enlightenment values—uh, emblematic of the ultimate rebellion against tyranny. To that end, we look at the history of the crushing of the church and the rise of enlightenment values and the rise of pluralism and diversity and multiculturalism as inherently Satanic. Lucien: Because Satanism means something to us. It’s not an arbitrary label. Tucker: …Right. I wish you were more straightforward about it. Lucien, cheerfully: I think you could really get into it! Tucker: …Yeah. Probably not. Lucien, thanks for joining us. I really appreciate it.